Oil Standard is a web browser plug-in that converts all prices from U.S. Dollars into the equivalent value in barrels of crude oil. When you load a web page, the script seamlessly inserts converted prices into the page. As the cost of oil fluctuates on the commodities exchange, prices rise and fall in real-time. I’d love to see a plug-in that (somehow) estimates how much oil it took to produce/transport that product. So you could comparison shop based on environmental impact. If you’re not familiar with Suncomm, they are the primary company the music industry uses to copy protect CDs. I just bought Bloom, the new Sarah McLachlan Remix CD. I wanted to import it into iTunes so I can listen to it along with the rest of my music… but I can’t. Suncomm won’t let me. They’ve intentionally crippled the Audio CD so it can’t be imported into iTunes. Sure, if I use their lame little application that auto-launches and allows me to “play” my CD, as if I don’t already have seventeen different apps that can play CDs already. Well, it certainly does. In protected WMA format. Which means I can play them in WindowsMedia player. Except I despise WindowsMedia player and should not have to use it. Since when is it OK for a company to tell me how I can use it’s product? I’m not pirating the disc, I’m not going to put it on a P2P network or share it with my friends… Sony/Arista/Sunncomm has simply assumed all consumers are pirates. I just want to listen to the music I purchased in the media player of my choosing! I can buy the entire album in unprotected MP3 format from SarahMcLachlan.com. MPR did a story on the Scallywags (the tall bike people)! All the Scallywags I’ve met are amazing people with astounding stories of how God has changed their lives. Very cool stuff. Check it out. If you’ve ever seen a member of the Minneapolis Scallywags Bike Club pedaling down the street, you’ll probably never forget the image. They ride tall bikes — made from bicycle frames stacked and welded together. The Scallywags ride to bring attention to their faith in Christ. 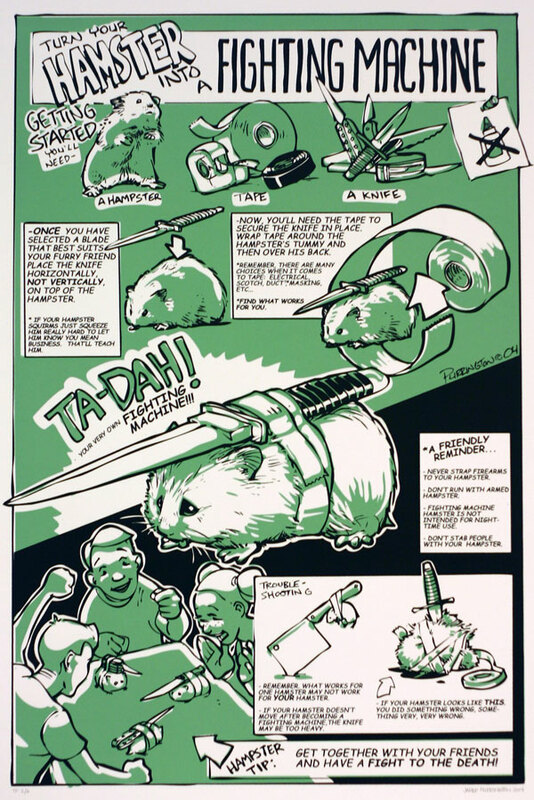 How To Turn Your Hamster into a Fighting Machine! So very, very wrong… but hilarious! Woman #1: The Bible says its 8AM. Woman #2: Yeah, sit down and shut up. Send your blog into space… free!